Counter-terrorism officers have launched an investigation following the vandalism of five mosques in Birmingham. Azhar Qayum from Muslim charity MEND told talkRADIO’s Matthew Wright that many mosques could not pay for security measures to keep worshippers safe. “A lot of mosques are quite small, with small congregations, and may not have the sort of resources to fund the security they need,” he said. According to the Home Office, Muslims are the religious group most at risk from religiously-motivated hate crime. However, this contrasts with funding of £14 million pledged last month for the specific protection of Jewish institutions. 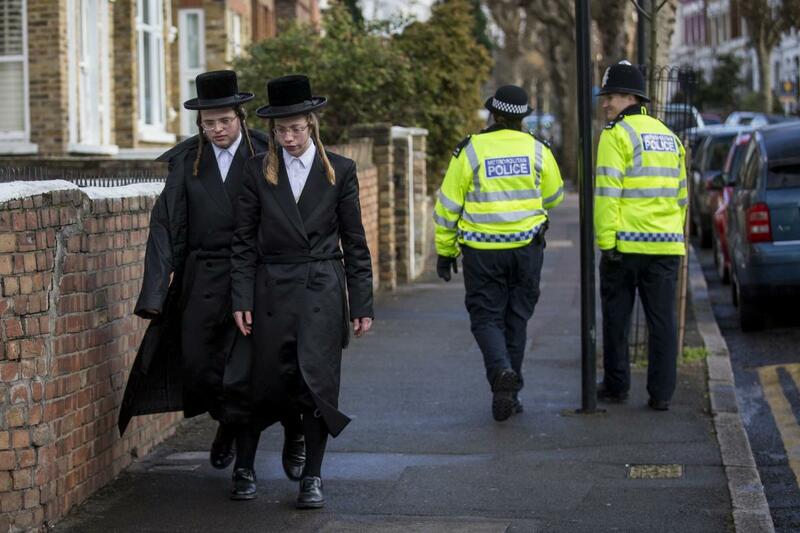 Metropolitan Police officers patrol a Jewish area of London in 2015. Mr Qayum said: “There is a big disparity in government funding for security. Home Office statistics reveal that 52 per cent of religiously-motivated hate crimes recorded by police between 2017 and 2018 were targeted at Muslims and 12 per cent at Jews. The Muslim Council of Britain has said a long-term commitment to provide similar support to Muslim communities was “absolutely essential in these troubling times”.